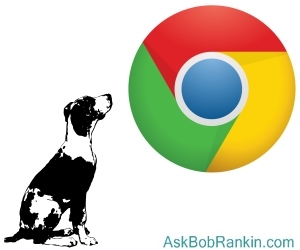 Wanna Make Chrome Sit Up and Bark? Perform a calculation: In Chrome’s “omnibox” (generally known as the address box), you can enter a mathematical calculation such as 60*60, and the result will appear even before you press Enter, in a dropdown below the omnibox. You can also ask things like "how many ounces in a cup" or "how many liters in a gallon" to get instant answers without leaving the page. Quickly enter a web address: For example, type amazon in the omnibox and press Ctrl-Enter. Chrome will add the "www." and the ".com" and whisk you away to www.amazon.com. Direct site search: - Start typing bi in Chrome’s omnibox. Before you even get to the letter "n" you will see “Press (tab) to search Bing” at the far right end of the omnibox. Press the Tab key and suddenly you are searching only within Bing. You just skipped Bing's home page and typing your query into its search box. Chrome maintains a list of “search engines” where this shortcut works, including Bing, eBay and a few others. (Yahoo used to be included in the fun here, but it no longer works for me.) To see the rest, go to the “Search” section of Chrome’s Settings and click on the button labeled “Manage search engines.” You can change your default search engine; modify or delete search engine entries; and way down at the bottom of the list you’ll find a form where you can add your own searchable site that you search often. Note that it can be a news or shopping or any other kind of site, as long as it has a “search” box of its own. This feature is also sensitive to sites you often use. I've noticed that as soon as I type the letter "a" in the omnibox, it shows “Press (tab) to search askbobrankin.com”. Find your downloads: Have you ever downloaded something, and then couldn't find it? Press Ctrl-J and Chrome will open a new tab showing all your recent downloads. From there, you can open the downloaded file, or view the folder where it resides. Restore a tab: Have you ever closed a tab by accident? That can be annoying, especially if it was a website that required a login, and you had navigated through several pages already. You don't have to redo all that work -- just press Ctrl-Shift-T and the tab will reopen, right where you left off. This is one of my favorite time savers in Chrome. You can also press and hold down the back button to see pages you've recently closed. Add a bookmarks: That little star at the far right end of the omnibox is a quick way to add a new bookmark. Just click it to add the current web page address to the last bookmark folder you used, or select another from the list of recent folders. Zoom in or out quickly: Press and hold the Ctrl key while rolling the mouse wheel up or down. You’ll zoom in or out on the current page; very handy for pages where the font is too small, or if you have limited vision. Using the Ctrl key along with the plus or minus key has the same effect. To return to the default zoom state, press Ctrl-0 (that's a zero). On a Mac, use the Command key instead of Ctrl. Translate whatever you want: You don’t have to depend on Chrome to ask if you want a page translated. Go download and install the Google Translate extension. Now you can highlight any text in your Chrome browser, click on the Translate icon, and there’s your translation (or a reasonable approximation). Quick Search: Search Google for a phrase that appears on your current page by highlighting it, then right clicking "Search Google for..."
Startup Options: Go into the “On startup” section in Chrome’s settings and select “Continue where you left off” or "Open a specific set of pages" to control what happens when you start Chrome. Incognito Mode: will disable browsing history and the storage of cookies, just in case you want to visit a website and not leave any tracks. Just be aware that your ISP (or employer) will still have a record of all websites you visit. Press Ctrl-Shift-N to enter Incognito Mode. Clear Browsing Data: An alternative to Incognito Mode is the option to clear some of all of your browsing data. Press Ctrl-Shift-Delete, and a window will open which gives you the option to delete items from a specific time range. Click the Advanced tab there for even more data scrubbing options. Offline Fun: If you try to load a page when you’re offline, and you’ll see little dinosaur on a desert landscape. Press the spacebar and the Dino Game begins! Use the up arrow to jump over a cactus, or die. To try it, there's no need to unplug your network cable, or turn off your wifi adapter. Just enter chrome://network-error/-106 in the omnibox to simulate on offline condition. Chrome Task Manager: See how much memory and CPU is being used for each tab and extension. Press Shift-Esc to open the task manager. Behind the Scenes: Right-click a page, then select "View page source" to see the underlying HTML code for the page. Kind of like looking at the source code for a program, and a good way to learn how some nifty features are implemented. Under the Hood: Right-click a page, then select "Inspect" to enter a world of data related to the HTML, CSS, images and other elements on the page. You can even edit the structure and content of the page! These are some of my favorite Chrome tricks. I'm sure there are dozens of others. Feel free to share yours in the comments below. Most recent comments on "Fun With Google Chrome: Tips and Tricks"
as a professional luddite, I am sticking with FireFox for the nonce. however, I am quite cross with their *taking*away* by *enhancement* the ability to open a number of tabs at once. if I am not saying that correctly, I have a bookmark folder called startup, and I used to click that and it would list all my bank accounts and other daily checks, and at the bottom, it would say something like "open all in tabs." now I have to ctrl+B to open book marks and ctrl+T, click bookmark 1, repeat, repeat, repeat, and it makes me a bit cross early in the morning before I have had coffee. I didn't test all your suggestions, but they sure are familiar -- from Firefox. Many of these topics will work equally well with other browsers like Opera and Firefox. Your example: "Quickly enter a web address: For example, type amazon in the omnibox and press Ctrl-Enter. Chrome will add the "www." and the ".com" and whisk you away to www.amazon.com." I already get this when I enter a word in my url box. I don't even have to press Ctrl-Enter. Chrome already enters the www and the .com for me. Firefox used to be my default browser. Now I use Waterfox (https://www.waterfoxproject.org/blog/waterfox-56.0-release-download) as my default. It is similar to Firefox (it was a clone that allowed ALL addons and extensions that the 64-bit Firefox blocked (note: Waterfox is a 64-bit browser). Recently, Waterfox has discontinued being a modified clone of Firefox and is becoming a distinctly separate browser, using a completely separate user profile. So changes to either Firefox or Waterfox will no longer be available in each browser automatically as it did before Waterfox v56. Waterfox v56 will be the last version of Waterfox (for a while) while and entirely new version is developed. One thing to note, while while the latest version of Firefox seems to have a problem (broken link) with Private Windows, Waterfox does not; it works correctly. Another benefit of the separate user profile is that you can now load Firefox and Waterfox, if needed, at the same time. Previously you could not since they shared the same profile. And, Waterfox seems to work faster for me than Firefox. I use the browser Vivaldi, which is Google Chrome compatible and uses all of its extensions. I’m going to install the translation one, and then see how many of these tricks work with Vivaldi. I think the ultimate trick with gAnything is the fact that it is not even optional to have a half-brain and remember things [no disrespect to any users]. Some may call that great benefit of gChrome (et al) as tracking unless the working half of your brain remembers to learn how to erase SOME of those foot-steps. Yes, certainly; there have been some benefits (add-ons) that devout Firefox users have had to forego with the FF v5x. Yet, FF TabSessionManager add-on is still functional along with most features (if not all) mentioned for gChrome. I don't think the 'dinosaur on a desert landscape' feature is going to convince the FF die-hards to switch. But I have to admit that google is becoming most difficult to avoid… along the foot-steps of the Borg! They work in the MS Edge browser too. Except the Dino game! pdsterling: "Open all in Tabs" is still in Firefox. I found it with a right-click on a bookmark folder. I use Vivaldi primarily, Firefox as well. I run Malwarebytes Pro (lifetime license) and every time I open Chrome it drops 5 tracking programs my Malwarebytes scan id's as "PUPs". Quarantines and deletes them. They're not malware but they do annoy me. And I absolutely insist on a file edit view menu, I've not really used Chrome since they took that away - without asking. FF does things like that too which always annoys me. So I open Chrome almost never. Vivaldi runs fine on my Win 10 machine and my MacBookPro as well. I really like being able to customize the browser FF has lost some of that but Chrome is just "our way or the highway" and with that attitude, I choose highway. Typing bi in Chrome’s omnibox just brings up the last site I visited starting with bi. Related to your "Multiple Windows For Related Tabs" (great tip btw), when I want to open multiple links on a particular website, I click onto the tab of the website and pull it downward. Now it is a brand new window with lots of space to open more tabs. Thank you for another informative article. I dislike using Google Chrome because of it tracking my browsing. If I look at a product on a merchant site, that product will show up repeatedly while browsing other sites. I find it creepy and intrusive. Secondly, Google blocks apps that copy you tube videos. I prefer to use Firefox. I haven't yet found a good reason to leave Firefox since its origin as Netscape. It has been a trusted faithful tool that is there for the user rather than for any financial gain. Many of these do not work on Chrome for Linux. a derivative of FF. Chromes inability to do this makes it a poor relation. For pdsterling who commented about Firefox and opening the same multiple tabs each day, try the add-on called Morning Coffee Quantum which lets you enter what sites you want to see every day (and on specific days if you don't want them every day). To enter the sites you want, Tools, Add-ons, click on Options for Morning Coffee Quantum, scroll down the page and you'll see where you can enter all the sites and save them. Then, you just click the coffee cup icon on the toolbar and all your sites for that day are opened in tabs. I've been using Morning Coffee for a few years and love it.